The Fotodiox FUSION ND Throttle Canon to Sony Adapter allows for the use of Canon EF and EF-S lenses on Sony full frame and crop sensor E mount cameras. The adapter's built in technology translates Sony's electronic commands so that Canon lenses act like native Sony lenses. The built-in variable ND filter provides up to 8.5 stops of control, which can be adjusted with a ring that is geared for either manual adjustments or with a follow focus system. The autofocus and exposure controls are controlled by your camera. This adapter is ideal for Sony E mount camera users who want to take advantage of certain Canon lenses for photography or cinematography purposes. Please see the Notes tab for more on compatibility. 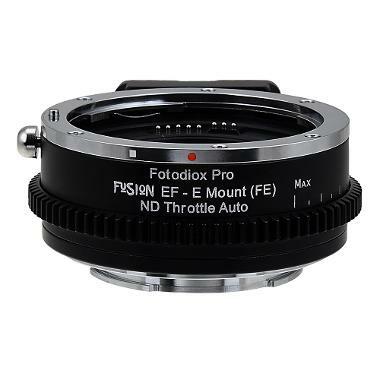 • Compatible with Canon EF and Canon EF-S mount lenses on Sony E mount cameras in both full frame (FE) and crop sensors. • Results vary when using certain lens/camera combos of EF/EF-S and E/FE mount gear. For example, pairing a Canon EF-S lens on a Sony a7 series camera in full frame mode will vignette. Please refer to this guide for more information.